Ilene's latest title, Lucy on the Ball is available. Learn to read with Ilene Cooper's adorable beagle puppy, Lucy! Lucy likes to run. She likes to bark. She likes to chew and howl. But when Bobby and his family take her to a lake, she finds out there's one thing she doesn't like—the water! Step 3 (Reading on Your Own) is for children who are ready to read independently. Step 3 titles have stories with easy-to-follow plots and engaging characters. Reviews of Look at Lucy! Bobby and his beagle puppy Lucy are back in this welcome sequel . . . Pets and kids are a natural combination, and Cooper gets the nervousness and bravado of third grade just right. New readers will look forward to watching Bobby face the same challenges they do . . . Will they want to read more about Bobby and Lucy? Absolutely. More Than a Million Lucy Books in Print! Now in her own series! Available at Target and Barnes and Noble stores everywhere. Bobby likes to watch sports, but he doesn't really like to play them. He'd rather play with his beagle puppy, Lucy. But when Bobby's friend Shawn asks him to join a soccer team, Bobby agrees. After all, his parents are always telling him to try new things. Soon, Bobby finds himself stuck on a soccer team with a tough coach and team members who have a knack for the sport. Even Lucy is better than Bobby at moving a soccer ball down the field! 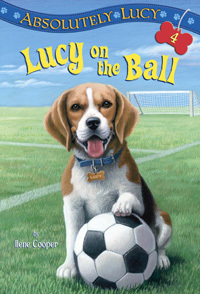 Soccer and Lucy the little beagle make for a winning combination in the latest entry to the Absolutely Lucy series. Bobby Quinn is shy. In fact, he's so shy, he has trouble making friends. But that changes when he gets a squirmy little puppy for his birthday. Unlike Bobby, Lucy isn't shy at all. And to his surprise, she keeps dragging him into all sorts of adventuresand friendships, too! When Bobby Quinn got a beagle puppy for his eighth birthday, his whole life changed. But now Lucy's taken off after a fat orange cat, and no one in the neighborhood has seen her anywhere. What will Bobby do if his best friend is gone for good? Bobby is so proud of his puppy Lucy. She's a terrific friend, and a great dog. So when a local store has a pet contest, he happily enters Lucy in it. But it turns out the pet that wins the contest may be featured on TV—with its owner! Bobby is shy. He doesn't like attention. But can he face the spotlight . . . for Lucy? In this heartwarming story of a boy and beagle's friendship, Ilene Cooper once again charms young readers and dog lovers alike.